Today, ICT increasingly penetrates into the various sectors of human life. Many students share the opinion that the education provided is not adequately linked to the practice. In order to enable universities and vocational schools to prepare students for the labor market, it is necessary to actively involve practice into education. In our case, one nice example is presented by the cooperation among three parties: companies, consultants, students. IDEC SA is a consulting company for businesses of all economic sectors, private or public. Among other services, IDEC provides guidance to people who want to start their own business and search for investment funding. On this basis, IDEC’s consultants develop business plans for their customers. IDEC also collaborates with several training organizations, providing consulting services concerning quality management and management and/or implementation of projects. Quite often, IDEC acts as a mediator between training organizations and companies. The learning providers can exchange their research results and fresh minds of their students with real business world challenges for their students. On the other side, companies can use the research results from the students in their R&D processes and exploit the creativity of fresh young minds with the potential of thinking outside the box. In addition, the HR departments of companies can use the interaction with students in order to find the best candidate for a job position. Testing the applicants in company’s real activities, employers can recognize the students’ skills to transfer their theoretical knowledge into practice, while the students can find out if this particular job suits best his/her potentials. Collaboration between these two communities involves a process of dynamic exchange of information and this usually happens through an online network. SP4CE Portal (available at sp4ce.eu) presents interesting solutions of above described collaborative learning. 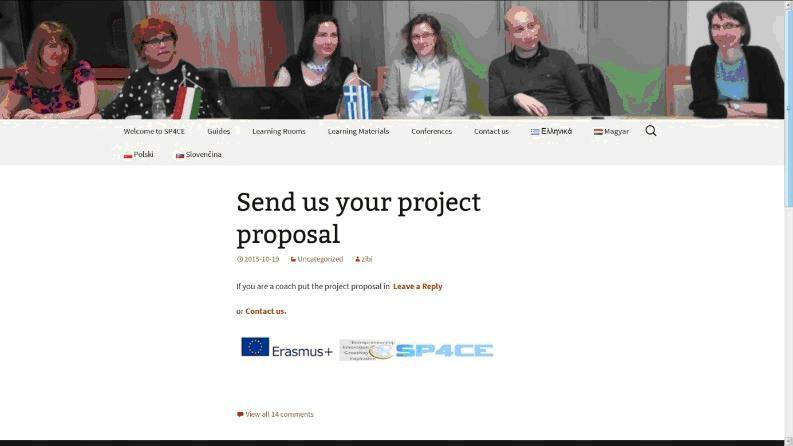 The portal contains online information about the project SP4CE itself, guides for particular target groups (coaches, mentors, students), interesting learning materials, contributions to the various conferences and a special part – challenge/call: “Send us your project proposal“. Via this challenge anyone can call for the help. It is a tool for looking for people interested in solving different kind of problems or for searching for partners for future cooperation operating in the same of different areas. When participants accept a challenge, the administrator creates a Learning Room, a specialized place, where all together can cooperate after signing up to a system. This challenge process works on the principle developed within EACEA project “OpenInn2.0: A Knowledge Generating House and e-Assessment Model”, where the platform Knowledge Generating House was used to generate groups of investigators and innovative solutions to very specific problems. Coaches – owners and/or managers of companies. They set the challenge and they provide information like project idea, description, available resources, and deadline for achieving the solution/results. Mentor – consultant, replies on the challenge, adds comments, provides tools, proposes time schedule. Students – University and VET students with interest in challenge topic. Search for partner– via link: “Send us your project proposal” anybody can publish a challenge for searching new partners, problem solution. Using portal sp4ce.eu, IDEC’s consultant publishes a challenge (Fig. 1). Description: IDEC looking for motivated young people interested in project management, to elaborate business plan for companies. All information and resources needed for the elaboration of the business plan will be provided. The challenge is promoted to the training organizations with which IDEC collaborates. Via discussion tool at the portal, the consultant describes the requirement in more details and discusses it with companies. Since both sides of communication agree on fact, that there is need for materials that cannot be published public, the consultant asks the portal administrator to open a new Learning Room (LR) for newly formatted group. Through publishing challenge, SP4CE portal presents a gateway for establishing cooperation. Subsequently this call is transformed into LR where the cooperation can really take place at several levels using various features of the SP4CE platform. The advantage of this open SP4CE portal is that users from different institutions can reply to one challenge and can work together further also on other projects in other areas. Most significant risk should be the lack of interest from users, i.e. despite the publication of the call, no one will respond and the challenger will have to use other ways of establishing cooperation. Another risk may arise by huge interest in cooperation and a hard decision would follow regarding with whom to establish collaboration. Time limitations – in case the challenger specifies a time limit for achieving the reply or solution, it can happen that nobody will manage to answer the call during the expected time. It is important to define the call very precisely with useful details to avoid misunderstandings. A very general call could not be interesting for users.